An absorbing start to the test saw the South African openers survive, but they certainly didn't thrive. There were balls that went between bat and pad, and others that took the edge, but didn't carry. South Africa will be slightly happier than Pakistan, but only slightly. It took 5 balls for Pakistan to take the lead in this match. South Africa was starting to look comfortable when they lost two wickets with the score on 46. However the second wicket brought Kallis to the crease, and at the moment he has looked as good as his record tells us he is. South Africa had been looking comfortable, and Kallis in particular in control until inexplicably he played a loose shot and got out. After Amla fell to the "so bad it's good" theory of bowling, de Villiers and du Plessis decided to see how slowly they could bat. At one point de Villiers had 3 off 31. AB de Villiers has batted for 2 hour or more in the first innings of a match 29 times before this innings, but this is easily his lowest score of those innings. It's another case of a wicket falling right at the end of an hour. 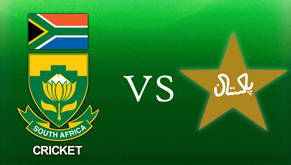 South Africa need to show better concentration if they are going to win this match. The concept of a specialist new ball spinner is a fairly new one, but Mohammed Hafeez is probably the benchmark. He doesn't look particularly scary, but has the ability to get the ball to skid through quickly, and against tail-enders that is deadly. Pakistan are well in the lead now. Everyone in the South African top 7 made it to 20, nobody made it past 50. Pakistan bowled well to create the pressure, but the South Africans can mostly blame themselves for their demise in that innings. Dale Steyn is a special bowler. When he's in a mood like that, what are the batsmen expected to do? Philander has bowled 5 overs for 6 runs, while Steyn has bowled 6 overs and has 3/8. Morkel is looking positively expensive having conceded 5 runs off 10 balls. There is a theory that swing bowling gets good batsmen out. I think that subtle swing bowling gets pretty much everybody out. Steyn hasn't swung many huge distances. In his entire spell there has only been one ball that was played and missed. The rest of them have taken the edge. The South Africans are masters at not doing too much with the ball. While Pakistan might have won more hours, they are certainly not ahead in the match! Since 1970 there have only been 5 teams bowled out for less than 50. Pakistan have a battle on their hands to stop that number increasing. Currently 2 of those 5 have been inflicted by Steyn, Philander, Morkel and Kallis. There is every chance that this group could add a third today. This really is a phenomenal South African side. It's as though this match is being played on two different pitches. One when South Africa is batting, and one when they are bowling. But the truth is that the pitch isn't the thing that caused the Pakistani meltdown. It was fantastic bowling. Creating pressure, and bowling deliveries that ask questions. Cricket's a simple game when you're as good as the South African attack. South Africa are just relentless. There has been some controversy about the use of Hotspot in this match, but that really doesn't change how one sided this match is. South Africa are just playing at a different level at the moment, and when they click they are almost unplayable. Unless they bat very well, it's hard to imagine Pakistan being anything other than totally discouraged after this match. The difference between South Africa's approach in the two innings is summed up neatly by AB de Villiers. In the first innings he was in for 31 overs and scored 31 runs. In the second innings he was in for 35 overs and scored 103 runs. It's amazing what a change in match situation does to a batsman. While Pakistan are still in trouble, this is a very good partnership, and while they are still there there is still a (small) glimmer of hope. The difference that a new ball makes for South Africa is phenomenal. I'm not sure there's been a more potent trio of quicks in the history of the game. These three all offer something different, and all are suited to different conditions. If the conditions don't suit Steyn, they will probably suit Philander or Morkel. Today it looks like this new ball suits both Steyn and Philander, and that would be difficult for world class batsmen to survive. How much more so for tail-enders who have grown up on the sub-continent? Another clinical performance by South Africa. While Roberts, Holding, Croft and Garner were more likely to injure batsmen, I fancy that this South African line up is more likely to get them out. Pakistan didn't actually play too badly in this match. But they were completely outgunned by a South African side that didn't actually even look like they hit top gear.